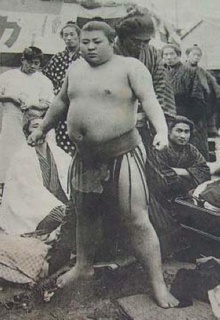 Born in Tokyo on February 9th 1886, Kohitachi Yoshitaro was adopted by the yokozuna-to-be Hitachiyama. He entered Dewanoumi beya with a weight of about 73 kg and a normal size for his age, but time will tell us that he will never go past 159 cm. 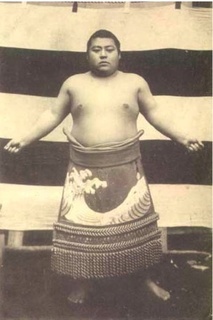 His first appearance on a banzuke was in May 1902. He reached the Juryo division in May 1907 and it took him only two basho to become the 661th makuuchi in sumo history, in May 1908. For his first basho, the “little Hitachiyama” was west maegashira 13. He won his first bout, against Tsuruwatari, who was four months younger than him, and his oshi-sumo was impressive, despite his small size. He lost only two bouts, against experienced rikishi, and managed a draw against the future 24th Yokozuna, Otori. He finished with a satisfactory score of 6W-2L-1D, and that made him east maegashira 9 in January 1909. It went differently for him this time, because on the first day of the tournament, Kohitachi faced the Yokozuna Umegatani II and suffered a loss. The day after, the maegashira was absent, and then alternated victories and losses until the 9th and last day, during which he was absent for the second time of the tournament, and so obtained a final score of 3W-4L-2A. Five months later, Kohitachi, who had fallen back to east maegashira 11, had a good tournament, in which he met no sanyaku, and lost for the second time against Otori, who was now ranked west maegashira 2. This kachi-koshi, with a 7-3 score, brings the Dewanoumi beya rikishi to the rank of east maegashira 4. 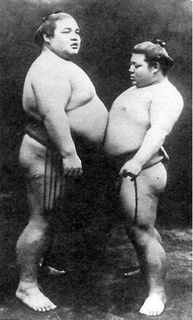 In January 1910, two rikishi attracted everyone’s attention: Otori and Kohitachi. Everybody wanted to see the extraordinary Otori, who needed only three basho in makuuchi to reach the rank of west sekiwake, and the surprising Kohitachi, who used oshi-sumo to challenge his opponents, despite his small size. Otori was very disappointing (2-6-2D); on the other hand, Kohitachi achieved an excellent basho, and participated in Otori’s rout, winning against him on day 6 and finishing with a positive 6-4 score. 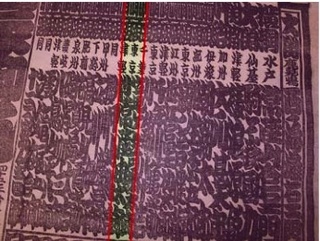 The same year, when the June banzuke was published, Kohitachi learned that he was now a sanyaku, with the rank of east komusubi. On day 1, which was 3rd June 1910, he suffered a loss against ozeki Kunimiyama, then won his second bout against maegashira Jintachi, and lost on day 3 against ozeki Tachiyama. Maybe injured, the shin-komusubi didn’t appear on day 4 to face maegashira Tamatsubaki, and was absent through the end of the tournament, which he finished with a score of one victory, two losses and seven absences. 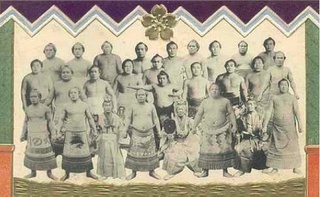 In February 1911, Kohitachi was kyujo (0-0-10A), while ranked east maegashira 3. He came back in June with the rank of east maegashira 8. He lost only one bout against the maegashira wrestlers, fought to a draw against the komusubi Chitosegawa, lost against the other sanyaku and against the yokozuna Tachiyama. His final score was 6-3-1D. He started the year of 1912, ranked west maegashira 2, with a disastrous series, and finished with a 3-6-1D. In May, he got a balanced score of five wins and five losses, at east maegashira 8, and that brought him to start the next year one rank lower. During the first basho of the next year, the general results were surprising because of the very high number of absences and draws. Kohitachi finished the tournament with four wins, one loss, three draws and two absences, which is almost a feat, and it made him west sekiwake for the next tournament. The new sanyaku completely failed in the year’s last basho (2-7-1A). The year 1914 began magnificently for Kohitachi, who defeated ozeki Otori on day one (earning his first ginboshi), then won against ozeki Isenohama on day 3, and finished the tournament with a kachi-koshi, which sent him for the second time to the rank of komusubi for the May tournament. This spring tournament was disastrous for Kohitachi, who got only one victory and gave up on day 6 (1-4-5A), and then announced his kyujo for the January 1915 basho. From May 1915 to May 1917, Kohitachi remained maegashira and alternated kachi-koshi and make-koshi, getting only one victory over an Ozeki, Isenohama. In January 1918, Kohitachi Yoshitaro was west maegashira 13, and after five consecutive losses he announced his intai, ending his career with a 70W-77L-2U-4D-47A score in makuuchi. He became the 7th Hidenoyama oyakata and died on September 15th 1927, at the age of 41. Yokozuna Umegatami II and Kohitachi. 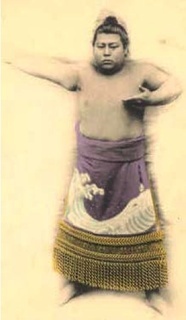 Kohitachi on the Banzuke, May 1912. Kohitachi facing his “father” Hitachiyama at an exhibition. The two of them never fought in an official tournament. 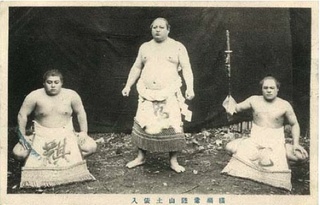 Kohitachi, at the centre, in dohyo-iri posture. 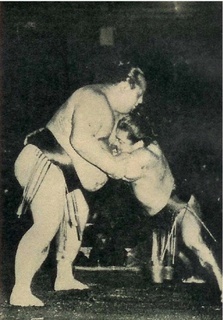 Kohitachi (left) as yokozuna Hitachiyama's tsuyu-harai (dew sweeper).